Take a walk in the country at Randox Antrim Show on Saturday 28th July when the country life showcase descends on the beautiful setting of Shanes Castle, Antrim. 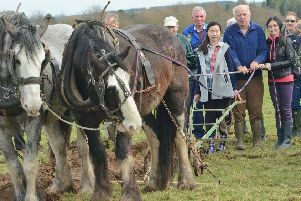 The event offers a fun-packed day where the best of the best of horses, cattle, sheep, pigs, goats, fruit, vegetables, flowers, photography, crafts and baked goods are brought to the one location for visitors’ enjoyment. You’ll also find a Festival of Food, dog agility displays, a petting zoo, sheep shearing, live music, dancing, and stalls to list only a few of the other attractions. New this year is a Youth Busking competition where a £250 prize is on offer. The competition is open to individuals or groups of up to six performers of secondary school age (U18s) from youth groups across the Antrim & Newtownabbey Borough. A Children’s Treasure Hunt is also new and free for U12s to take part in; offering an extra element to the range of children’s entertainment on offer. Following the event website’s revamp, this year there is the option to avail of discounted early bird tickets on the show website until Wednesday, July 25. Paula McIntyre’s cookery demonstrations in the ‘Festival of Food’ marquee - surrounded by food producers keen for the public to sample their wares - has become one of the event’s most popular attractions. As examples of what can be found in the Home Industries and Horticulture section, Antrim is hosting a new Women’s Institute team competition on the theme of ‘Afternoon Tea’ and is on the hunt for the Show’s ‘Gardener of the Year’ and County Antrim Shows’ Best Chocolate Cake. In the entertainment marquee the jiving competition introduced last year returns to see who will win the ‘King & Queen of the Castle 2018’ title. There’s a tempting first place prize of £200 on offer to the winning couple, £100 for second and £50 for third. Entries for the jiving competition are taken on the day of the show just before it starts at 2.30pm. The Children’s Pet Show always draws a good crowd. Open to U16s, it is £1 to enter on the day, just ahead of judging at 1.30pm in the cattle rings. Look out for the sign. Details of all of the event’s competitions can be found on the Show’s website. The close date of the receipt of entries has been extended until midnight on Saturday 21st July 2018. So, there’s still time to enter online for the Show’s various livestock, equine, horticulture and home industries competitions. Further details, including show schedule, entry forms and the option to enter online, are now available at www.randoxantrimshow.com, or by emailing secretary@antrimshow.com. Only equine classes can be entered on the day and late entry fees will now apply in this section. New livestock/equine classes include working hunter classes for ponies and horses and in the sheep section, classes have been added for the new, Suffolk Cheviot breed. This year Antrim is proud to be hosting the Northern Ireland Shorthorn Club’s National Championship, the NI Dexter Group’s Premier Show, NI British Blue Heifer Championship, NI Limousin Championship, incorporating the Young Limousin Breeders’ Anglo Irish Stockjudging Competition, the final of the Bank of Ireland and NISA pedigree Junior bull Championship; and, in the sheep section, the Border Leicester National Show. Antrim is also a qualifier for the Bluegrass/NISA Clydesdale Championship 2018 and the Linden Foods/NISA Pedigree Beef Heifer Championships. Randox Antrim Show takes place on Saturday 28th July at Shanes Castle, from 9am until 5pm. Discounted early bird tickets are available via www.randoxantrimshow.com until Wednesday, July 25. Admission on the day is £10 per person and children under 16 years of age go free when accompanied by a paying adult. Car parking is free.